To complement the spirit of springtime renewal, you’ll sail on luxurious boutique ships designed with your every comfort in mind. From the fine amenities found in elegantly appointed riverview staterooms and the delicious cuisine that puts us at the forefront of river cruising, to the charming personalities of our staff, you’ll sail in stylish luxury and comfort as you discover the peaceful rhythm of springtime in Europe. Experience Dutch flower culture at its height. Sip a glass of Riesling as you cruise through the UNESCO-designated Rhine. Celebrate the best of these regions’ nature, art, and history during the peaceful time of spring. All things that come to mind when we think of the Netherlands and Belgium-colorful canals, whimsical windmills, vibrant tulips, rich maritime history, and the art-Rembrandt, Rubens, and Vermeer-are yours to experience in all of their real-life glory. Call Iannazzi Enterprises for more details! *Savings listed in US dollars. Actual savings vary by program and may be less. Pay-in-Full Savings is not combinable with the Early Booking Savings or any other promotional offers, and requires full payment at time of booking. Subject to availability. Capacity controlled. Other restrictions may apply. Uniworld reserves the right to withdraw or change offers at any time. After the successful editions of last year, Villa La Massa invites you again on a fascinating journey through the grand Villas and Gardens of Tuscany. During the 6 days program, the dynamic Armand de Foucault, a Frenchman specialized in History of Gardens, will be your host as you tour magnificent estates to learn of the raison d’êtrebehind their lush landscaping as well as the history of the art, architecture and the place that surrounds them. Visit Floriade in 2012, a World Horticultural Expo staged once every ten years in the Netherlands. Take part in the 2012 World Horticultural Exposition, Floriade, in the Netherlands, with Uniworld Boutique River Cruises. Referred to as the “Theater of Nature,” this global spectacle, held only once every 10 years, has the world’s most exquisite and exceptional flowers, plants, trees, and more on display. There are five unique themed exhibits, each with its own décor, and cultural programs of music, dance, literature, theater, and visual art from all over the world. With Uniworld’s two new 2012 itineraries showcasing Floriade, experience nature like never before all while sailing on the elegant River Ambassador. To top it off, discover the sights and sounds of the UNESCO-designated Upper Middle Rhine Valley, and its Dutch and Belgian tributaries, uncovering the best of old and new world Europe. Pay in full at time of booking to SAVE up to $2,000 per couple. *Savings listed in US dollars. Actual savings vary by program and category, and may be less. Pay-in-Full Savings is not combinable with the Early Booking Savings or any other promotional offers, and requires full payment at time of booking. Subject to availability. Capacity controlled. Other restrictions may apply. Uniworld reserves the right to withdraw or change offers at any time. Once every ten years, the Netherlands hosts Floriade – a World Horticulture Exposition showcasing garden-inspired exhibits from around the globe. In 2012, a full day visit to Floriade’s “theatre of nature” in Venlo is a highlight of our riverboat cruise through the inland waterways of Belgium and Holland aboard ms Swiss Sapphire, ms Swiss Jewel or new-for-2011 ms Treasures – making your ringside seat for nature’s colorful show that much more spectacular! Check out the Aalsmeer Flower Auction and visit Keukenhof Gardens or Haarlem in Holland’s bulb country. Take a private cruise through Amsterdam’s canals and experience the past at the Zuiderzee Museum. Taste Belgian beer, observe cheese-weighing in Gouda and porcelain-making in Delft, and enjoy an interactive culinary experience at Château Neercanne – a Tauck Exclusive! Tour renowned art museums and World War II sites, and visit Bruges or Ghent, Brussels, Amsterdam, Antwerp, the Hague and more on this most popular of Holland cruises. Gratuities to ship staff, drivers, Tauck Directors and Tauck Cruise Director, airport transfers, 25 meals, wine with dinner on the riverboat and more! THESE EXCLUSIVE DEPARTURES WILL SELL OUT FAST – CALL US TO HOLD YOUR SPACE ON THIS ONCE-IN-EVERY-TEN-YEARS EXPERIENCE! Enjoy an aerial view of the Cotswolds from our new A&K balloon! Launched from Pittville Park in the Regency spa town of Cheltenham for the first time on 10th June, the new Abercrombie & Kent hot air balloon is now available for flights exclusively to A&K clients. The balloon will be flown from the beautiful gardens of Barnsley House Hotel, in the heart of the Cotswolds. Enjoy stunning panoramic views of the peaceful English countryside as you glide across miles of green landscape and quaint villages dotted with honey-coloured cottages, the perfect way to capture the essence of this idyllic location. To celebrate the launch of our eye-catching balloon, we have put together a Cotswold itinerary incorporating an exclusive flight as well as visits to some of the most famous and enchanting Cotswold gardens and quintessentially English villages. We have teamed up with Barnsley House, a picturesque Cotswold stone house built in 1697, to offer you 4 nights for the price of 3 when booking our Aerial View of the Cotswolds itinerary before 23rd December 2011. This is the perfect opportunity to experience the real English countryside. You will be met at the airport by your private representative and transferred to Barnsley House Hotel in the heart of the Cotswolds. Your local representative will meet you at the hotel reception and assist with checking in. He/she will run through your itinerary with you and answer any questions you may have. Your representative is then available by telephone throughout your vacation to answer any queries. An early start this morning, enjoy the calm tranquillity of the English countryside from the air with a special opportunity to fly in A&K’s own hot air balloon. The flight promises spectacular panoramic views of the Cotswolds with its quaint villages and acres of green land. After coming back down to earth with a (small) bump, the rest of the day will be spent exploring some of the best loved gardens of the Cotswolds. Visit Buscot Park, a neo-classical country mansion, once home to Lord Faringdon and a fantastic series of murals painstakingly produced by the pre-raphaelite painter Edward Burne-Jones, and the enchanting gardens of Malmsbury, home to the intrepid ‘Naked Gardeners’. If booked sufficiently far in advance, you may also be able to secure an invitation to visit Highgrove, the private gardens of the Prince of Wales and Duchess of Cornwall. Return to your hotel for an evening at leisure. Why not unwind in the extensive gardens of Barnsley House. Formal structures and planting styles, a herb garden, flower borders, and the ornamental vegetable garden make this an interesting and varied garden to explore. Today you will head towards the north Cotswolds. Along the way, head to the chocolate box village of Bibury, one of the most photographed of all villages in England where quaint cottages date from the 14th century. Also, make a quick detour to Burford, voted the 6th most idyllic destination in Europe by Forbes in 2009. Burford High Street sweeps down the hill towards the River Windrush and is lined with many interesting shops, including antiques shops, where souvenirs can be purchased. One of the local pubs is a great spot to sample some local cuisine for your lunch prior to heading to the delightful gardens of Hidcote Manor and Kiftsgate Court. The masterpiece of Hidcote Gardens consists of a series of outdoor ‘rooms’, each separated by walls and hedges of many different species and created by the horticulturist Major John Lawrence. Kiftsgate Court also offers a series of interconnecting gardens, each with a distinct character, and is home to the largest rose in England. This morning you will take a walking tour with a local guide to explore the beautiful Georgian city of Bath, often regarded as one of the loveliest cities in all of England. From its beginnings as a Roman camp in the first century AD, Bath developed through troubled centuries to emerge in the 1700’s as a fashionable “spa” resort. Some of England’s best-preserved Georgian architecture is housed here, together with fascinating relics of earlier eras. Visit the Roman Baths that were discovered in an excellent state of preservation near to Bath Abbey church and also see the magnificent Palladian architecture for which the city is renowned, seen at its best in the Circus and the Royal Crescent. Transfer to London this morning for your departure flight or alternatively your itinerary can be extended to include a tour of London and the surrounding area. 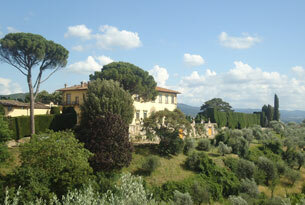 we invite you to take a fascinating journey through the grand villas and gardens of Tuscany. 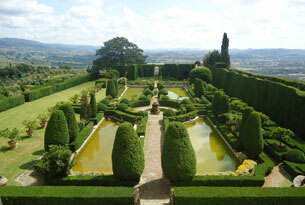 Over the course of 6 days, the dynamic duo of Armand de Foucault and Andrea Ghiottonelli, a Frenchman and a Florentine, both specialized in History of Gardens (Hortibus – Paris/Florence), will be your hosts as you tour magnificent estates to learn of the raison d’etre behind their lush landscaping as well as the history of the art, architecture and the place that surrounds them. Call us for a detailed itinerary….. In this marvelous program we combine everyone’s fascination with Jane Austen with some of the most beautiful scenery, exquisite villages and gardens in England. Follow in Jane Austen’s footsteps, walk where she has walked, stand where she must have stood, and tread where she has trod. See some of the incredible locations from the film versions of her novels, and just imagine… Explore and experience the countryside that inspired her to write Northanger Abbey, Sense and Sensibility, Emma, Mansfield Park, Persuasion and Pride and Prejudice. We start in Hampshire. Amidst this stunning countryside, Jane was inspired to create many of her characters, whilst experiencing 18th century society for the first 25 years of her life. In the pretty village of Chawton we visit Jane Austen’s House and Museum. This 17th century house is where she wrote and revised many of her novels and the bookcase contains first editions of some of them. In addition, the pretty garden has many varieties of plants and herbs common in the late 18th century. Then to beautiful, Georgian Bath – a UNESCO World Heritage Site – which was home to Jane Austen from 1801 to 1806 after she moved from rural Hampshire to enjoy fashionable city life. Jane Austen set two of her six published novels, Northanger Abbey and Persuasion, in Bath. Let the pages from her novels come to life as you visit their locations and discover more about her life in Bath. We will also visit the incredible Roman Baths, the magnificent 15th century Abbey and gardens in and around the city. We’ll visit Lacock, a wonderfully preserved village dating from the 13th century, which played the village of ‘Meryton’ in the BBC’s ‘Pride and Prejudice’. Here the Bennet girls shopped for bonnets, sought the latest tittle-tattle from their Aunt Philips, and hoped to attract the attentions of the officers – in particular a certain Mr. Wickham. Lacock Abbey was also the location for films, Emma, Harry Potter, Pride and Prejudice, Cranford, The Other Boleyn Girl and Wolfman. And we’ll stop in Tetbury known for its 25 antique shops and home to Prince Charles’ Highgrove Shop (Highgrove, his home, is nearby.) The town is known as an ‘architectural gem’ as many of the wool merchants’ houses still look as they did 300 years ago. And on to the glorious Cotswolds. The Cotswold landscape is one of the most evocative in England. Gently rolling hills, secluded wooded valleys, clear running streams, picturesque, unspoilt, golden stone villages all paint a picture of timeless beauty. One typical village is Adlestrop where Jane Austen made several visits to stay with her uncle who was the Church rector. It is rumored that the house and grounds of Adlestrop Park were the setting for her novel Mansfield Park. The crowning glory of the Cotswolds is its gardens and we will visit some of the finest including Hidcote Manor, Kiftsgate Court, Sudeley Castle and more. As with all our personally escorted small group tours, many special features and lovely accommodations will be included. Space is extremely limited – call us now to hold your place.